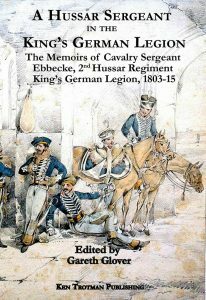 Memoirs from King’s German Legion troops are relatively rare, (beyond a number of letters relating to their Waterloo experiences) and the 2nd KGL Hussars presently has no memorialist at all – until now. This short memoir of Sergeant Ludwig Ebbecke was published in German in 1851, but has never been translated into English. I was sent a copy of this booklet many years ago but it was only recently with the help of Ralf ? ?, who was able to translate the old German for me, that I have been able to bring this forward for publishing. The King’s German Legion was formed in 1803 after France overran Hanover, the German state which was still ruled by the King’s of Britain. Many young German’s did not want to live under the French yoke and they made their way to the North Sea coast, where they found British ships waiting to transport them to Britain. Initially a Royal Warrant was issued for the formation of a corps of light infantry, called the ‘King’s German Regiment’. So many recruits arrived however, that the initial scheme expanded greatly and eventually the legion consisted of ten infantry battalions, five cavalry regiments, six artillery batteries and a small corps of engineers; it became in fact a small army. One of those who joined was Ludwig Ebbecke who fled Germany to join the German Legion, having already previously been conscripted into the Hanoverian army. Arriving in Britain he tried to join the horse artillery, but finding that they were fully recruited, he joined the 2nd Hussars King’s German Legion. He served at Stralsund, the Siege of Copenhagen in 1807, and was nearly shipwrecked on the passage back to Britain. He went to Walcheren in 1809, although there was very little for him to do there and served in the peninsular from 1810 to 1812, including being involved at the Battle of Barossa. In 1813 he sailed home to help a remount and replacement men prepare for active service and sailed back with them, but they were diverted to Holland in 1813 and covered the troops during the assault on Bergen op Zoom and was the messenger taking a number of pieces of important information into the fortress of Antwerp during the final stages of the war. His regiment remained in Belgium when the ‘Hundred Day’ campaign began, but the fighting was over before they arrived on the battlefield, missing Waterloo. He retired to Hanover and remained within the Hanoverian cavalry for a further twenty years, married twice and had a number of children. Ebbecke did eventually receive a General Service Medal in 1848 with one bar for Barossa; the regiment’s involvement in the other actions being deemed too small to warrant a battle honour. I found his memoir of great interest with a number of unusual facets to his story and I hope you enjoy it too. King George I was of course from Hanover and he retained control of the German state as Elector even when he took the throne of Britain in 1714.